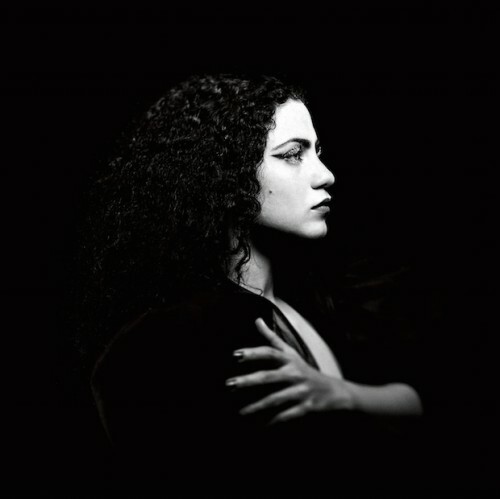 Emel Mathlouthi’s new album Ensen presents complex songs dominated by percussions and electronic sounds. The songs are political and social in nature while being emotional and personal. 35-year old singer-songwriter Emel Mathlouthi began her career a long time ago before she became famous with Kelmti Hourra (My Word is Free). While listening to American singer-songwriters from the 60s such as Joan Baez, Bob Dylan and others, she was equally inspired by musicians such as Sheikh Imam (1918-1995) who was an Egyptian artist and famous for collaborating with the equally famous poet Ahmed Fouad Negm (1929-2013). Other artists such as Marcel Khalifa, who is a Lebanese composer, singer and oud player played an important role as well. Her earliest experiment in making music was playing in a metal band. She is now often described as a „protest musician“ herself. Recorded in New York, Stockholm, Reykjavik, in the Cevennes Mountains, Treminiers Countryside, Montreuil, Sousse, and Studio Bellevue the result is ten songs mostly in Arabic except for one song, Lost. Her new album is a combination of mostly percussions and electronic sounds but she still makes use of the acoustic guitar, establishing a new sound which is familiar, yet different. The album is co-produced by Valgeir Siguròsson, who is famous for collaborations with Björk, and by her main collaborator, the French/Tunisian producer Amine Metani. The single Ensen Dhaif (Human, Helpless Human) was selected by Pitchfork as the best new track, and overall the album has been positively received. While working on the new sound, and becoming more electronic, she found difficulties in finding the right producer for making Ensen. She decided to start a crowdfunding campaign to make Ensen possible. It is not uncommon, that artists uses crowdfunding campaigns to help with their artistic endeavors. Jordanian based-band El-Morabba3 has previously used crowdfunding campaigns, alongside Mashrou3 Leila, and more recently Palestinian artist Ruba Shamshoum and Egyptian singer-songwriter Youssra El-Hawary. One of the more standout songs Kadesh (How Many?) is one of those politically and socially charged songs. How many, how many battered women/How, how many people migrate/How many, how many shipwrecked boats/How difficult is the gestation? Her songs have sometimes traces of Björk, and other electronic, experimental artists. Nevertheless her music is tied to traditional elements which she still tries to keep in her music. Ensen marks a new phase in her musical career, shifting away from the acoustically charged sound of Kelmti Hourra to a more experimentally, electronic sound. Ensen was released with Partisan Records.